Today the Census Department released its first "Advance Economic Indicators Report". The new report adds wholesale and retail inventories to its existing International Trade in Goods report. For details see Trade Deficit Widens as Imports Rise More Than Exports; Advance Economic Indicators Initial Release. Following the report, the GDPNow Forecast dropped 0.5 percentage points to 1.8%. The final GDPNow model forecast for real GDP growth (seasonally adjusted annual rate) in the second quarter of 2016 is 1.8 percent on July 28, down from 2.3 percent on July 27. After the U.S. Census Bureau's inaugural release of its advance economic indicators report, which covers retail and wholesale inventories and foreign trade in goods, the nowcast of the contribution of net exports to second-quarter real GDP growth declined from 0.17 percentage points to -0.10 percentage points and the nowcast of the contribution of inventory investment to growth declined from -0.63 percentage points to -0.79 percentage points. That is the final DGPNow forecast for the second quarter. The "Advance" BEA Gross Domestic Product, for 2nd quarter 2016 comes out tomorrow. 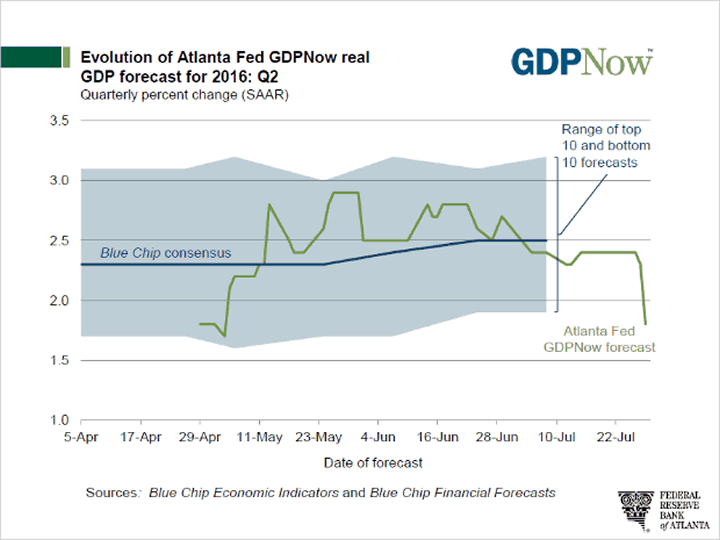 The next GDPNow forecast will be for third quarter. Note how lagging these BEA GDP reports are. The third quarter is nearly a third over and we will just now get data for the second quarter (and it will be revised again and again). © 2016 Mike Shedlock, All Rights Reserved.